A southeastern Indiana American Legion post is continuing the nationwide trend of posts highlighting the link between World War I and The American Legion’s formation, by renaming itself after a Hoosier hero of that war. Madison as a town (1809) is older than Indiana as a state (1816). An early center for both riverboat and railroad traffic, more than 130 blocks of its downtown make up the Madison Historic District – a National Historic Landmark – for a mix of architecture that spans decades. In line with that tradition of early adoption, Jefferson Post 9 received its initial charter on June 20, 1919, and its permanent charter on Nov. 29, 1920. The “Jefferson” refers to Jefferson County, where Madison is located. In the rural part of the county, Maj. Samuel Woodfill was born in 1883. He enlisted in the Army in 1901, and served in the Philippine-American War and at the Mexican border before the start of World War I. On Oct. 12, 1918, in Cunel, France – during the Meuse-Argonne Offensive – Woodfill’s actions against a German machine-gun nest, which culminated in hand-to-hand fighting, resulted in his receipt of the Medal of Honor, making him the only Hoosier to earn one during the war. He was presented with his award by Gen. “Black Jack” Pershing himself in France in February 1919. Pershing admired Woodfill greatly – in fact, he called him “the outstanding soldier of World War I.” He was chosen to participate in the 1921 ceremonies at the Tomb of the Unknown Soldier. A re-commissioned Woodfill spent World War II as an instructor training infantry troops. He died in 1951, and was eventually re-buried at Arlington National Cemetery – 50 feet from Pershing. A delegation from the Polish army presented Woodfill with two medals at the 1929 American Legion national convention in Louisville, Ky. He promoted the building of posts in Kentucky and Massachusetts, and was referred to as a member in media of the time. With the autumn of 2018 approaching – and thus the 100th anniversary of Woodfill’s medal-earning feats – it was decided that Post 9 would rename itself after him. Both were noted during an Oct. 12 (the actual anniversary) ceremony at the Indiana Veterans Memorial Cemetery in north Madison; the cemetery unveiled a bronze bust of Woodfill, and Post 9 attended in force. 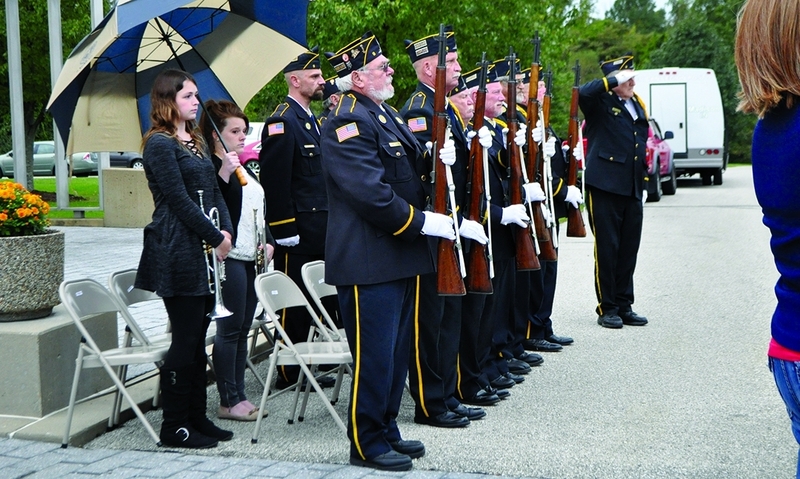 The post’s honor guard participated in the ceremony; post adjutant David “Tank” Sherman says of the unit, “They have performed 136 services so far this year for departed veterans. A very professional and very dedicated group of men and women (including Sons, Riders and veterans).” The post has an active Riders chapter that has participated in the yearly summer Legacy Run to the national convention, and is currently collecting blankets to present to veterans in nursing homes. And scholarships are awarded each year at four different schools; in this less-densely-populated area, the post draws members from throughout the county and even across the Ohio River in Kentucky. As Post 9 approaches its own 100th birthday, one might be able to say that it has a new member in Maj. Samuel Woodfill. Note: According to Section 1 of the Post Adjutant’s Manual, “If changing the name when applying for a permanent charter or after the permanent charter has already been established, send a copy of the minutes or the resolution, or both, to department headquarters. The department will request the name change."